Yohime is a noblewoman who lived 400 years ago. 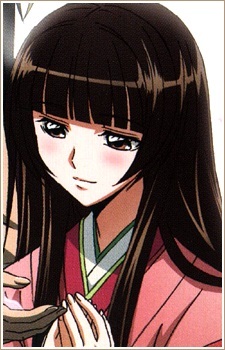 She is Nurarihyon's wife, Rihan's mother and Rikuo's grandmother. She has the ability to heal illnesses and injuries even though she's human. Her father took advantage of the people's desire for healing by charging exorbitant fees that only the wealthy could afford. Yohime herself was kind but sheltered and only saw the outside world after meeting Nurarihyon, who spirited her away from her family's home to give her a taste of the real world. She was targeted and kidnapped by Hagoromo Gitsune, but was rescued by Nurarihyon after a grueling battle. After their son Rihan was born, she worried constantly about her husband and preferred he not get involved in unnecessary fights.